Cheniere Energy subsidiary Corpus Christi Liquefaction commenced production at the Corpus Christi LNG (CCL) plant in November 2018. Covering an area of approximately 1,000 acres, the project site is located on the La Quinta Channel, north-east of Corpus Christi Bay in San Patricio County, Texas, US. The project is being developed in three stages, with stage one commissioned in November 2018. The liquefaction plant receives feed gas supply from the Eagle Ford Shale, located approximately 60km from the project site. The first two stages of the project comprise the construction of three LNG trains with a liquefaction capacity of 4.5 million metric tonnes per annum (mtpa) each. Two LNG liquefaction trains were developed in stage one, while one more LNG train is under construction in stage two. Seven mid-scale liquefaction trains along with the associated pipeline structures will be constructed in stage three. 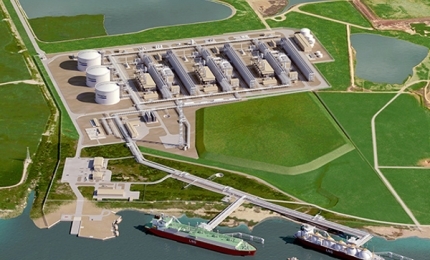 The Corpus Christi LNG project is expected to achieve its planned 23Mtpa capacity by 2022. Estimated investment on the first two stages of the project is $15bn. The plant is capable of performing both natural gas liquefaction and regasification and is equipped with associated import and export facilities. In addition to the three LNG trains, the first two stages of the project also involve the construction of three 160,000m³ LNG storage tanks, two shipping berths that can accommodate vessels with capacity of up to 267,000m³ and an export / import natural gas pipeline. Two LNG trains, two storage tanks, one complete berth and a second partial berth were constructed as part of stage one. Stage two involves construction of an LNG train and an additional storage tank, as well as the completion of the second berth. Natural gas is exported or imported through a bidirectional, 23-mile long, 48in diameter and 5bcf/d capacity pipeline, which interconnects with interstate and intrastate natural gas transmission pipelines in South Texas. The vapourisation component of the project comprises two trains with a combined processing capacity of 200 million metric standard cubic feet a day (Mmscfd). Along with the construction of seven mid-scale trains, the third stage expansion will involve a new 33.7km-long and 42in-diameter bi-directional gas pipeline parallel to the existing 48in-diameter gas pipeline connecting the export terminal. The LNG trains incorporate ConocoPhillips’ proprietary Optimized Cascade technology, which integrates three refrigeration phases involving propane, ethylene and methane to cool the natural gas. Each LNG train is fitted with six GE LM2500 G4+ gas turbine-driven refrigerant compressors. Freeport LNG is expanding its existing LNG regasification terminal at Freeport, Texas, by adding liquefaction facilities. The vaporisation trains comprise ambient air vapourisers (AAVs). Enel Group will purchase three billion cubic metres of gas a year from train one, Iberdrola and PT Pertamina (Persero) will respectively purchase 0.8Mtpa and 1.52Mtpa of LNG from trains one and two, and Endesa Generación will purchase approximately 2.25Mtpa from the two trains. Woodside Energy Trading Singapore and Gas Natural Fenosa LNG will purchase 0.85Mtpa and 1.5Mtpa of LNG respectively from train two. Central El Campesino agreed to purchase 0.6Mtpa of LNG. Électricité de France (EDF) will purchase 0.77Mtpa of LNG from trains two and three and Energias de Portugal (EDP) has agreed to purchase 0.77Mtpa of LNG from train three. In February 2018, China National Petroleum Corporation (CNPC) subsidiary PetroChina signed two sales and purchase agreements for 1.2Mtpa from the export terminal. The sale and purchase agreements (SPA) are valid for a term of 20 years, extendable by an additional ten years. Kinder Morgan Texas Pipeline, Kinder Morgan Tejas Pipeline and Tennessee Gas Pipeline Company (TGP) agreed to provide 550,000 dekatherms a day (Dth/d) of firm natural gas transportation service, including 3bcf of natural gas storage capacity, under a 15-year agreement. The transportation capacity is expandable by 800,000Dth/d. The total cost for the construction of the first two trains, one berth and the natural gas supply pipeline was estimated to be $11.5bn. Debt commitments for the project, amounting to $8.4bn, were arranged by 31 commercial banks and other financial institutions, while $3.1bn of equity was provided by affiliates of Cheniere Energy through capital raises from EIG Global Energy Partners. Bechtel was awarded two engineering, procurement and construction (EPC) contracts worth $7.1bn and $2.4bn for stages one and two of the project in December 2013. Baker Hughes was contracted for providing the turbomachinery equipment for the third LNG train of the Corpus Christi project in June 2018.